14th August 2015. A Friday evening, in a working men’s club. Not an unfamiliar setting for me, but this particular evening will not simply consist of drinking lager and dissecting the football results. I was in Newton Aycliffe, at the heart of the Sedgefield constituency. This is Tony Blair’s old constituency, hallowed ground for Labour supporters, especially Blairites such as Kendall. As I entered the barroom and surveyed the scene, I wondered if old ways still linger among the constituents and the members of the Constituency Labour Party (CLP). I reason with myself that 24 years of an extremely high-profile Labour right-winger, followed by Phil Wilson, the current MP, made firmly in the Blairite mould, must surely have had an effect on the mindset of the members. Are they sick of Blairism, and ready for a huge swing in the opposite direction? Or are they much more likely to retreat into their own comfort zone and their established method of success, and move further to the centre? Hoping that the latter was the case is perhaps why Liz Kendall chose to make her North East appearance in this particular constituency. I imagine that she may also have wished to pay pilgrimage to her idol’s old home. If she truly wished to pay homage to him though, I thought that the best setting would be the legendary Trimdon Labour Club, Tony Blair’s former campaign HQ, but perhaps she wished to avoid direct comparison. The whole tenor of her campaign has been about the future. Attempting to mimic Blair would present her as a harrowing reminder of the past. Phil Wilson, the current MP for Sedgefield, a firm Blairite who nominated Kendall, spoke first. Despite my politics being well to the left of his, I am fond of the man, mainly because of how much he reminds me of my own family. My grandfather and Phil’s father were Durham coal miners. 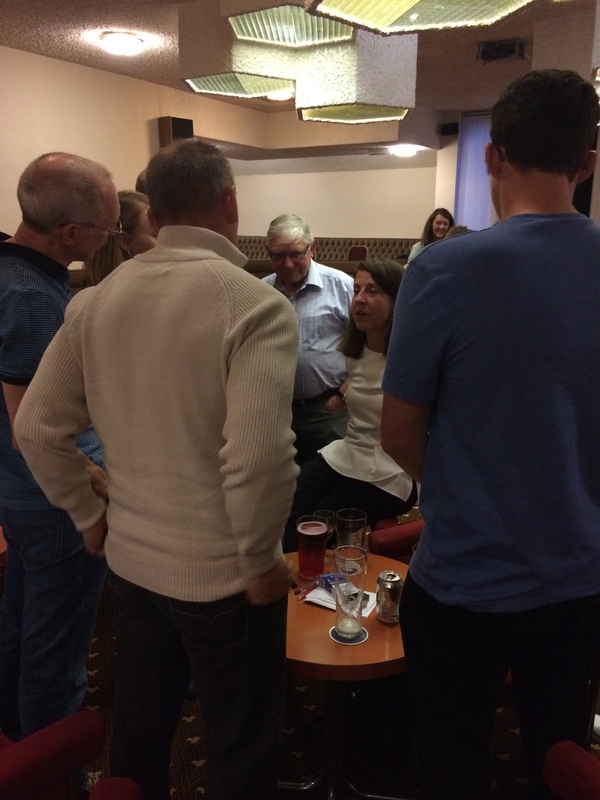 In my own CLP, neighbouring North West Durham, we had a debate about the leadership. My own MP, Pat Glass, nominated Andy Burnham and spoke on his behalf. Phil spoke for Kendall, and although I had been unmoved by Kendall up to that point, his words stuck in my mind. He recounted his father saying to him when he was a boy, ‘Phil, you can do what you like, but you’re not gannin’ down the pit.’ That resonated with me. It encapsulated the aspirations of so many families, including my own, to escape a life in the mine. I deeply regretted not receiving the opportunity to speak to him on the day. I was certain he would be at the Kendall campaign meeting, so, for his sake, I resolved to attend, and give Kendall a fair hearing. Eschewing a microphone, Phil addressed the crowd in his confident coalfield accent, stressing the need for a fresh start. The huge poster behind him, bearing Kendall’s face and blazoned with the words ‘Liz Kendall: A Fresh Start’ bore him out on that at least. In his brief speech, he spoke of the need for Labour government, and that to do so we had to appeal to all people. As one last precaution to prevent a possible negative backlash against Kendall from the unconvinced in the room, he finished on a topic that is popular with any crowd – an old Labour favourite, the NHS. He outlined the damage the Tories were doing to it, and the importance of Labour returning to power in order to save it. As he welcomed Kendall the room applauded and I took advantage of this momentary lull in speaking to appraise how genuine her seemingly warm welcome from the crowd was. The room was, in my mind, surprisingly full. I had been under the impression that her grassroots campaign was virtually non-existent; that she couldn’t draw a decent-sized crowd anywhere, whilst Jeremy Corbyn was attracting thousands wherever he went. The vast majority of the people in the room were middle aged and above. White is by far the most common hair colour in this audience. It occurs to me how much that contrasts with the surge of youth support for Corbyn’s campaign. I spied an acquaintance from a Corbyn campaign organisation meeting, presumably also there simply to observe. I wonder how many others in the room are doing the same. As the fulsome applause faded, Kendall started to speak. Unlike Wilson, she chose to use the microphone. Unsurprisingly, she got underway by extolling the virtues of modernisation, appealing to all, and the paramount importance of demonstrating economic competency. She decried the Tories’ record in government, their stoking of English nationalism, their attacks on the NHS, and, guaranteed to be a popular topic in Durham, their changes to trade union laws. After the trauma of the strike in 1984/5, ex-miners hold their trade unions very dear indeed. When she claimed that it’s time for female Labour leader, the crowd broke into spontaneous applause. I admit I was surprised; I had not expected people of the crowd’s age to be so progressive, especially when the only female Prime Minister is so despised by ex-miners. I suppose Kendall has a point. It’s just a shame that there are no obvious young women from the left of the Labour Party who could have run for the leadership instead of Jeremy. Next she says that ‘wealth creation is as important as wealth distribution’, citing the Hitachi factory in this constituency, and the famous Nissan car factory in nearby Washington. She cleverly tacks on the fact that the factory was opened and is maintained with EU funding, using this as cover demonstrate her commitment to a Yes vote in the forthcoming referendum. ‘That was deftly done’, I think in admiration. Now economic competence. Convincing Labour voters that eradicating the deficit is a key task is difficult, since it sounds too similar to the Tories. But Kendall has another ace up her sleeve. She quotes the great Aneurin Bevan, famous Labour left winger and father of the NHS, ‘freedom is the byproduct of an economic surplus’, validating her economic message. She has the audience eating out of the palm of her hand now. 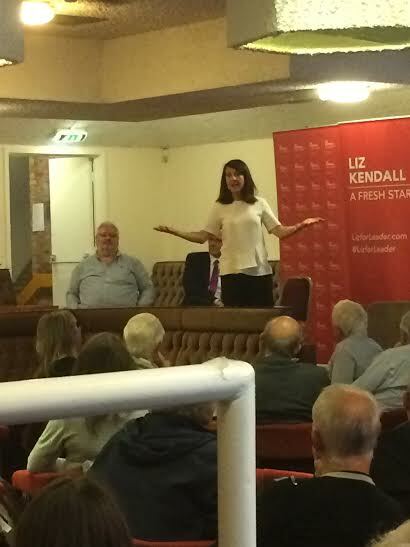 She vigorously defends the record of the last Labour government, praising the minimum wage, civil partnerships, sure start, and reducing NHS waiting times, and sits down to rapturous applause. Now the floor is thrown open to questions. She has gone down very positively thus far – this CLP did nominate her after all – but I wonder how she will fare at one-on-one questioning. Two of the first three questioners implore her to stand down, so the anti-Corbyn vote. This is her first challenge, although perhaps not the sort she was expecting. She has been criticised regularly for being too right wing and not offering enough concessions to the left of the party. I expected audience members tonight to do the same. But instead, two people were quite insistent that Kendall and Yvette Cooper should stand down, to allow Andy Burnham to tackle Jeremy head-to-head. I can feel the atmosphere bristling. Clearly, some people agree with this woman. Others are outraged. Kendall has to defuse the tension, but give an honest answer. Admirably, Liz refuses to back down, saying she’ll fight to the end, and will never stop fighting for her ideas within the party, ruling out any chance of leaving, should Corbyn win. To her credit, she did not portray herself as similar to Burnham and Cooper, emphasising her differences from them. Against Burnham’s pledge to renationalise the railways, she bravely risked upsetting the audience (renationalisation is an extremely popular idea round here) by arguing that nationalistion brings more power into Whitehall, when what she wants to do is decentralise. It occurs to me that you can combine public ownership with decentralisation, but I keep that to myself. It’s my turn to ask a question. In contrast to the earthy, practical questions that have been put before me, I try to turn the conversation a tad more intellectual, not aided by my stupid-sounding accent. ‘Would you describe yourself as a socialist, and what does the word “socialism” mean to you?’ I boom, and sit down smugly. I immediately notice a few faces wrinkle in annoyance at my unpractical question, but, again, Kendall wins my respect by tackling it head on, quoting the membership card, as I expected her to, that Labour is a socialist party and believes power should be in the hands of the many, not the few. A reasonable answer, I muse. But she once again exceeds my expectations with a nifty quote, this time the IMF statement that countries with bigger income inequality have less growth. She seems to have all this left wing knowledge, yet still holds the views she does. Such a waste. After more questions and more applause, the audience resumes talking amongst itself and Kendall circles the room, glass of wine in hand. While waiting my turn for a selfie with her (the requisite skill for any politician these days), I quietly introduced myself to Wilson. Such a nice man who clearly wants the best for his constituents, but he just can’t see how a lifelong rebel can lead the party. “I’m a deputy whip, and he’s defied the whip over 500 times. When someone wants to defy him, how am I supposed to defend him?” he said, incredulous. I didn’t want to upset him further, so I decided not to mention that I’m a Corbyn supporter. I left with a heavy heart, sad to tear myself away from the conversation. And although Kendall performed admirably, she inadvertently left me even more convinced; left wing economics are the best, and Corbyn is the only one offering them. 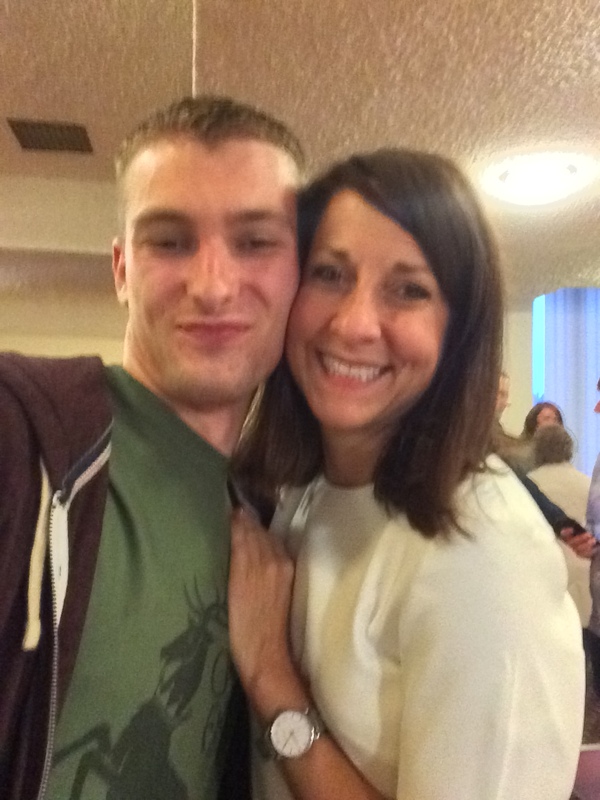 The author (Benjamin Eckford) and Kendall pose for an obligatory politician selfie.